Do you need an operating agreement prepared to govern your NJ LLC? Are you facing threats of litigation against you as member of a New Jersey LLC? Are you dealing with the removal or expulsion of a member(s) of your LLC? Is your LLC being threatened with a lawsuit? Are you buying or selling an LLC and need to be properly represented? If the Answer to Any of These Questions is “YES”, Then This Site Was Written For You. The attorneys at Hanlon Niemann & Wright have written all types of operating agreements addressing all types of business issues and situations. Because of this we are able to evaluate and counsel you on issues you face in the real world of business all the time. It’s that experience that also helps us represent you and/or the LLC if things go wrong. Fredrick P. Niemann, Esq. and the lawyers at Hanlon Niemann & Wright understand NJ LLC laws and the issues that must be considered to protect you and the interests of your LLC. Understanding exactly what an LLC is… and what it is not is a good starting point for our discussion. A limited liability company (LLC) is a hybrid business organization. I use the word “hybrid” because an LLC combines the features of both a corporation and a partnership, yet it is neither “strictly” a corporation or a partnership under New Jersey law. Instead, an LLC is created and organized by an agreement between members who are free to write it any way they want provided the terms of the agreement are not prohibited under the LLC statutes of New Jersey. In addition, federal and state tax laws generally recognize and treat an LLC as a partnership, meaning taxable gains and losses flow to the members personally and are reported on their individual 1040 income tax returns. Therefore, if the LLC is structured properly, no federal income tax is payable directly by the LLC; rather, any taxable gain is passed onto the members through a K-1 when a profit is earned. This avoids double taxation to each LLC member that otherwise occurs within “C” corporations. An LLC is formed and becomes a legal entity when the certificate of formation is filed in the Division of Revenue in the Department of the Treasury and the Secretary of State unless the certificate provides for a different effective date, and the LLC has at least one member. In addition, the members can memorialize all pre-formation agreements among themselves in a document entitled an “Operating Agreement”. I discuss operating agreements in much greater detail on this site. The act requires a document known as a statement of authority to be filed in the Division of Revenue. This instrument provides public notice that one or more persons within the LLC have authority to act on behalf of the LLC. The statement of authority can describe the scope as well as the limitations on the named individual’s authority and can direct the reader to the person or office, should communication with the LLC be required. This document is much like the registered agent statement commonly filed by “C” and “S” corporations. The provisions of the LLC act state that an LLC is managed by its members unless the operating agreement provides for one or more managers to assume that role. The act provides that each member in a member-managed LLC has equal rights in management. 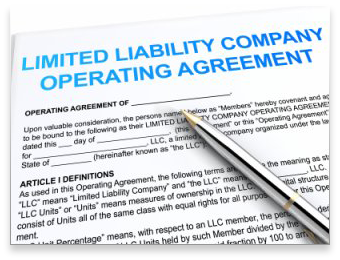 Thus, a 25% (percent) member has the same rights as a 75% (percent) member in the LLC, unless there is an operating agreement which provides otherwise. Therefore, it should be apparent to all readers the critical importance of memorializing in writing the voting rights and impact of each member’s vote on issues that come up impacting the LLC in the future. This is a really big deal under New Jersey’s LLC laws. Under what is called the default provision(s) of the LLC Act, profits and distributions to members are to be made in equal shares among the members, rather than pro rata according to their capital contributions or capital accounts. This may (it likely will) contradict the expectation of the members, particularly those who have made larger capital contributions than their co-members. To negate this default rule the members can provide a different formula for distribution of profit(s) and compensation in their written operating agreement. Again, another important reason to have a written operating agreement. Similar to shareholders of a “C” or “S” corporation, New Jersey grants the members of an LLC broad (but not absolute) statutory protection from personal liability. Instead an LLC member risks only the capital that the member invests into the LLC. Avoidance of personal legal liability is very important to many entrepreneurs and business people and a compelling reason to form an LLC when the nature of the enterprise is risky and subject to legal claims. If you’re contemplating the creation of an LLC and want to address the important points of your agreement in writing, I invite you to contact me toll-free at (855) 376-5291 or email me at fniemann@hnlawfirm.com . If you read further into this page and later pages of this site, you’ll appreciate how much better off you’ll be if you put your LLC agreement on paper. The legal consequences of not doing so are many. TESTIMONIALI own several small businesses. I’m good at what I do but legal matters and dealing with lawyers and legal issues is stressful. I called Fredrick P. Niemann and have developed a great relationship with his lawyers and staff. They have reviewed my leases, negotiated the buyout of my former business partner, handled land use problems in a neighboring county and generally have really been there for me. I really like them personally and professionally. If you are a small business owner, give them a call. Many of the most successful small and medium-sized LLC’s in NJ are founded on a strong relationship between two or more members. But if the relationship breaks down, the consequences can be devastating. It’s hard to be objective when your company interests are being threatened and it seldom makes sense for those involved to sort out the problem themselves. If not resolved quickly and decisively, company or member disputes can deplete business resources, focus, and create adverse interpersonal relationships among members. Many attorneys and/or law firms only offer transactional LLC services. When faced with the prospect of a business dispute from whatever source, a lawsuit and eventual courtroom involvement, they’ll quickly bail out and refer their LLC client (you) elsewhere. Not us, we’re with you all the way and we’ll continue to serve you throughout the entire matter. We’ve negotiated, settlements and dismissals and tried to conclusion many types of LLC disputes involving expulsions, member resignations; breaches of non-compete and restrictive covenants, contract and insurance clauses, tortuous business practices and buyouts of member interests. These are just some examples of our significant Limited Liability Company litigation background. If your case involves an actual or potential LLC dispute, lawsuit or conflict among members and you would like to speak to a firm member personally, call Fredrick P. Niemann toll-free at (855) 376-5291 or e-mail him at fniemann@hnlawfirm.com. At Hanlon Niemann & Wright, we are experienced NJ business and LLC lawyers who will champion your interests with confidence. And just for the record, we charge much less than the big firms out there notorious for fee gauging.